evOS 5 is one of the neatest GUIs I've seen so far! 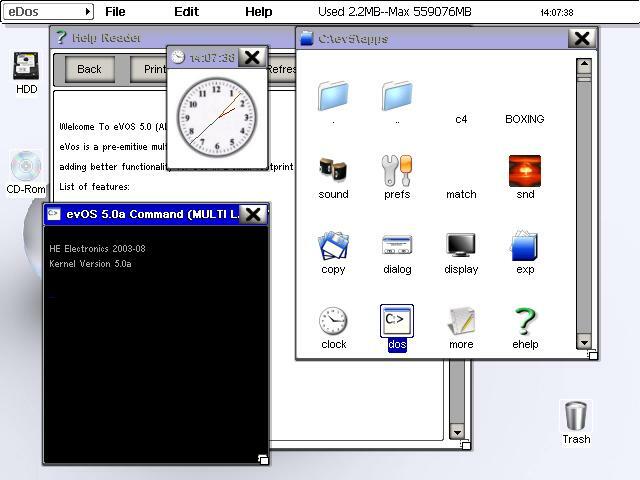 The GUI is made in FreeBASIC and represents quite well a good, full-featured GUI. evOS has its own programming-like language used for making applications (i.e. the "Apps" folder). The language is simple to pick up and learn. The GUI runs in SVGA mode and performs quite well for its size. There are a few quirks here and there but overall a GUI worth trying. Works well. Is a bit slow (takes about ten minutes to open the Apps window). Functionally EV5 is very good.